Over the last fifty years scientists have found in nature enough evidence of a previously unknown natural phenomenon that, although similar to "traditional" Tsunamis, may in fact cause an incomparable level of destruction along the coastlines. Such wave of huge proportions will be probably triggered in the Atlantic Ocean anytime in the next 500 years thus posing a daunting threat for the East Coast of America, North Africa and Europe. Waves of this type are called Mega Tsunami. They are so great that they can reach several hundred meters in height, travel at the speed of a jet aircraft and get up to 12 miles (20 Kilometers) inland. A mega-tsunami is an extremely rare and destructive phenomenon that strikes the world every few thousand years. Unfortunately, as seen in the documentary above, there is a concrete possibility that it will occur again in the near future. A mega-tsunami has almost unlimited power to cause utter destruction and there's nothing we can do to stop it. Even the most powerful waves, the tidal waves known to science by their Japanese name Tsunami, cannot create such destruction. A mega-tsunami is an informal term to describe a tsunami with initial wave amplitude (height) much larger than usual tsunamis. Mega-tsunamis are several tens, hundreds, or possibly thousands of meters high and they are able to cross oceans and ravage countries on the other side of the world. Generally, a tsunami is caused by an earthquake near the shore or underwater. Normal tsunamis usually originate from offshore earthquakes, submarine landslides and undersea volcanic activity, and range from barely perceptible waves to walls of water up to 300 feet high. The biggest submarine earthquakes can shift the ocean bed up or down by around 10 metres and that produces tsunamis on that sort of scale, but not very much bigger. Normal tsunamis created by an earthquake on the ocean floor have only small wave heights while off shore. They also have a very long wavelength (often hundreds of kilometres long) and they generally pass unnoticed at sea, forming only a slight swell usually of the order of 30 cm (12 inch) above the normal sea surface. However, the height of normal tsunami waves increases dramatically when they reach land as the base of the wave pushes the water column on top of it upwards. By contrast, something massive is needed to create waves with such a great height in the case of a mega-tsunami. 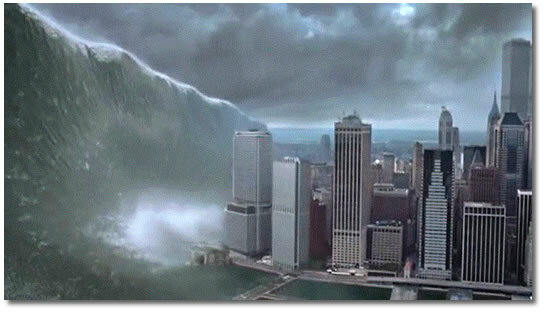 So, what kind of event can create a mega-tsunami? Unlike usual tsunamis, mega-tsunamis are caused by giant landslides and other impact events such as volcanic eruptions or huge asteroids crashing into the sea. These phenomena rapidly displace large volumes of water, as energy from falling debris or expansion is transferred to the water. Huge earthquake-induced rockslides next to bodies of water can generate mega-tsunamis since the massive amount of water displacement increases the wave size more than a submarine earthquake. Luckily, huge landslides and the mega-tsunamis that they can generate are extremely rare. In most cases, tsunamis caused by rockslides, unlike the ocean-wide tsunamis caused by some underwater earthquakes, dissipate quickly and rarely affect coastlines distant from the source due to the small area of sea affected. However, a massive landslide can give rise to much larger local shock waves (solitons = solitary waves that can travel for long distances without changing their shape or losing energy). However, in some cases, they can generate a mega-tsunami that can reach the height of hundreds of meters. That is the case when a massive landslide occurs in a limited body of water and the resulting wave is unable to disperse, just as it happened in Alaska where a major rock fall generated the Lituya Bay tsunami. It was the largest tsunami wave ever observed anywhere in the world and it was caused by a rock fall in Lituya Bay, Alaska on July 9, 1958. The Lituya Bay mega-tsunami was triggered by an earthquake with a magnitude of 8.0 occurred along the Alaskan Fairweather Fault, which runs beneath the north-western spur of Lituya Bay. A massive volume (approximately 40 million cubic meters) of rock alongside the Gilbert Inlet sloughed off into the water, generating a wave which reached the incredible height of 525 meter (1,720 feet) on the opposite side of the inlet. Down the inlet itself, the initial wave reached a height of 600 feet (120 meter) moving toward the ocean at 100 mph (160 km/h). Five square miles of land surrounding the bay were inundated and stripped of all vegetation and wildlife. The tsunami sunk three solitary fishing boats anchored in the harbour and moved inland as far as 3600 feet. However, the tsunami's energy and height diminished rapidly away from the source area and, once in the open ocean, it dissipated and was hardly recorded by tide gauge stations. Image: Mega-Tsunami: The 1958 wave at Lituya Bay was rather large! On October 9, 1963, approximately five years after the Lituya Bay disaster, an enormous landslide of about 260 million cubic metres of forest, earth, and rock, fell into the reservoir of one of the highest dams in the world, the Vajont Dam on Monte Toc, Italy, at up to 110 km per hour (68 mph). The resulting displacement of water caused 50 million cubic metres of water to overtop the dam in a 250-metre high megatsunami wave. The flooding destroyed the villages of Longarone, Pirago, Rivalta, Villanova and Fae, killing 1,450 people. More than 2,000 people (some sources report 1,909) perished in total. Image: The Vajont Dam as seen from the village Longarone in 2005, showing approximately the top 60-70 meters of concrete. The 200-250 meter wall of water that overtopped the dam and destroyed the village would have obscured virtually all of the sky in this photo. The following video shows a physics-based computer simulation of a landslide mega tsunami in an alpine reservoir. Large rock falls and landslides off steep slopes adjacent to mountain reservoirs can generate water waves that can overtop the impounding dam and cause massive flood destruction below. That is the case with what happened at Vajont Dam, Italy in 1963.